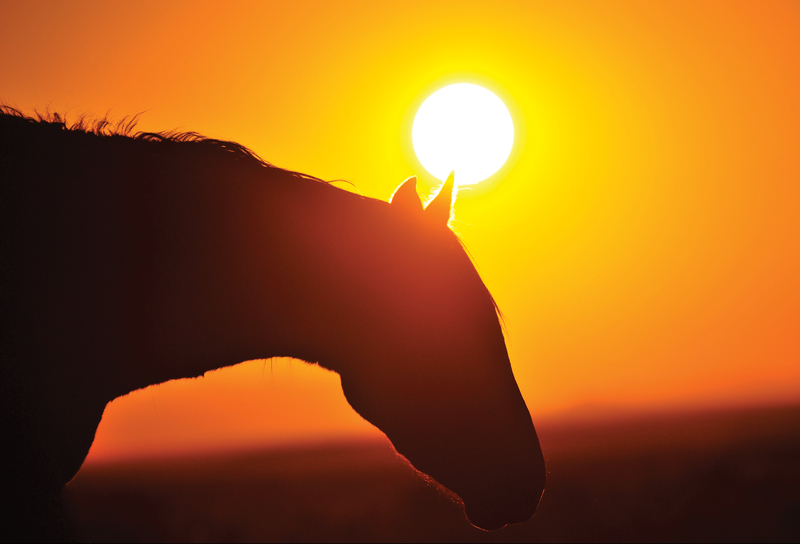 ON A SWELTERING DAY IN SOUTHERN NAMIBIA, I FOLLOWED A TURN-OFF ONTO A RUTTED DIRT ROAD LEADING TO THE VIEWPOINT AT GARUB, WHERE HORSES FROM ACROSS THE ARID PLAINS HAD GATHERED, STANDING IN THE SUN AS IF THE GLARING CELESTIAL BODY WAS SHINING BLESSINGS ONTO THEIR SWEAT-LADEN HIDES. A FEW WANDERED OFF INTO THE EXPANSIVE LANDSCAPE, SOME DRANK FROM THE WATER TROUGHS AND OTHERS WHINNIED AND CHALLENGED EACH OTHER FOR SPACE OR SPORT. T he wild horses assemble around the water troughs at Garub, twenty kilometres west of Aus on the road towards the coastal town of Lüderitz. The area borders on the Namib-Naukluft Park and the Sperrgebiet, a restricted diamond area in south-western Namibia to which access had been denied to visitors since the discovery of diamonds in 1908. In the early 2000s the area was opened to accommodate a limited form of tourism. There are several theories about the origin of these horses, one being that they were part of a cargo of domestic animals transported on a freighter that ran aground in the late 19th century south of the mouth of the Orange River, the border between Namibia and South Africa. The wild horses at Garub were first noted in the 1920s. In their 90 years of existence, their numbers have fluctuated between 50 and 280 horses, droughts and the tough conditions of a desert existence keeping their numbers low. 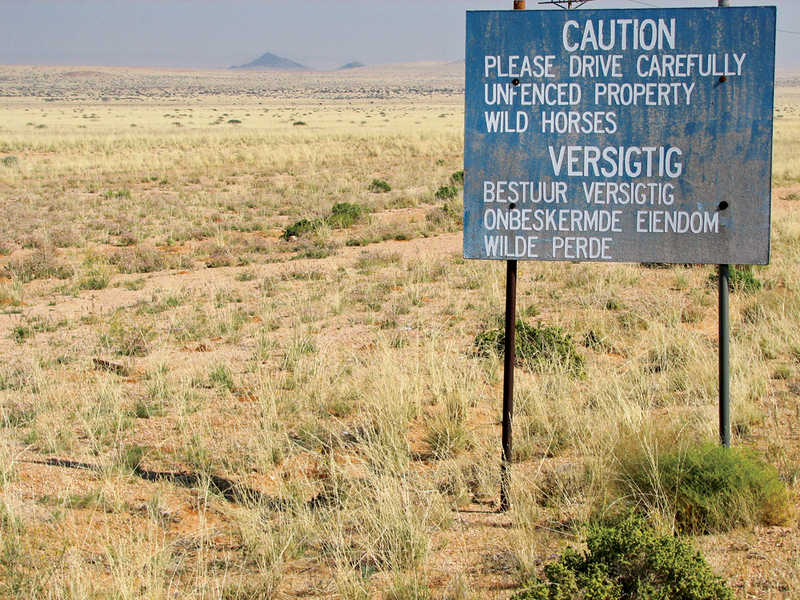 For their first 70–80 years, the horses lived in the protected Sperrgebiet diamond area, which provided sanctuary from hunters and horse capturers. This and a permanent water source have ensured their survival. Wild horses of unknown origin encourage speculation and there are many theories as to how they ended up in south-western Namibia. Horses appeared in Southern Africa only in the seventeenth century, introduced by the European colonists. The horses, however, would have had to make their way across 200 kilometres of desert to arrive at Garub. Another theory is that horses belonging to Baron von Wolf, the owner of Duwisib Castle situated 250 kilometres north-east of Garub, were released or escaped from Duwisib after Von Wolf’s death in the First World War. Casting doubt on the latter theory is the historical fact that a manager at Duwisib at the time had recorded no horses going missing until approximately 1940. The Garub horses had made their appearance twenty years earlier. A further cloud of doubt invalidating this theory is that it is in the nature of horses to stay in the area they are accustomed to as long as there is food and water rather than to migrate, and the size and characteristics of the present herd indicate that it grew from a larger core group. The more plausible theory is that in early 1915 there was military action in the vicinity of Aus and Garub that involved large numbers of horses. German troops with hundreds of horses were positioned near Aus, and South African forces advanced from Lüderitz to set up camp near Garub with 6 000 horses of their own. When the Germans bombed the area on 27 March 1915 as a delay tactic to mask their retreat, the horses scattered in panic. The South Africans, in their haste to follow the retreating Germans (apparently they had only two days), would not have had time to locate and retrieve all their missing animals. A theory that adds to this convincingly, is that there was another group of horses south of Garub on Kubub, a farm belonging to Emil Kreplin, mayor of Lüderitz from 1909–1914. Kreplin rented Kubub from 1911 until the end of the First World War when South West Africa was annexed to the Union of South Africa, and he was interned and deported to Germany. Kreplin bred work- and racehorses, and there are similarities today between the Kubub horses, as seen in photographs from the time, and the Garub horses. It seems plausible that when these horses were abandoned, they made their way to Garub to look for water, following the green grass and scattered rainfall, most likely joining the horses that were already massed there, depending on the fragile lifeline. When the war was over and people returned to their farms, the farming activities would have pushed the horses into the safety of the protected diamond area. The Garub and Kubub horses (and other abandoned animals) may have initially gathered in the mountains around Aus where natural waterholes held water at the end of the summer rainfall period, and were then subsequently attracted to the Garub borehole where they were assured of water. These could well be the ancestors of the feral horses seen today at Garub and referred to as the wild horses of the Namib. The restricted diamond area Sperr­gebiet II was incorporated into the Namib-Naukluft Park in 1986. Research carried out on the horses suggests that rather than the horses adapting genetically to their challenging conditions in the Namib Desert, they have adapted their behaviour to suit the arid environment, their grazing and drinking patterns varying with the seasons. Myth and mystery continue to surround the wild horses of Namibia, and the romance associated with the domesticated turning wild that envelops their origins. Their freedom and escape from confines express the feeling that most have when they experience the wilderness and open spaces of Namibia after the fettered grasp of modern living. As dusk settles, a lone horse peers over the beauty of the Namib. 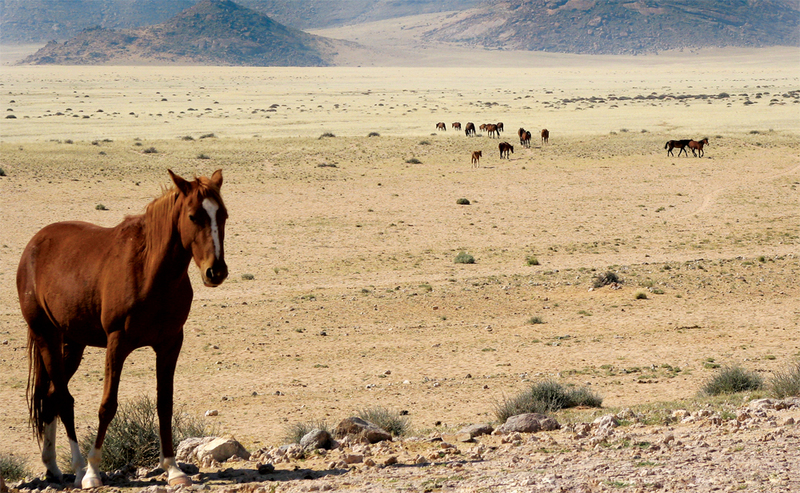 There is another group of Namibian wild horses that is often overlooked. A small pocket of feral horses in the very south of the country roams the canyon area from Sulphur Springs to Ai-Ais. Sometimes encountered by hikers in the Fish River Canyon, these horses are not dependent on humans for water like the Garub horses, but drink from the puddles and pools in the Fish River course as it makes its way southwards. Out of the public eye, they remain exquisite apparitions appearing unexpectedly as you turn a bend in the canyon, when the heat dazzles, the blue sky forms a canopy above and the green reeds and birdsong offer cool respite from long hiking days. Bondelswarts area, where he stayed for a few months with his sheep. It was there that he came across many horses. Horses had lost their status in the 1940s with the advent of cars, and most people were happy to get rid of them, often giving them to their workers as remuneration. The farmer purchased some of these animals from local Namas, paying R8 per horse, and took approximately thirty horses back to his canyon farm. As it was impossible to fence off the area, the horses soon became feral. In 1992, before he died and his wife sold the farm, his son attempted to catch them, rounding them up with his motorbike. Chance intervened and when, on the last stretch, he fell off his bike and broke his collarbone, and the horses became free once again. Forty years after they were initially brought to the canyon, roughly thirty horses are still believed to exist here. They live a tough life, evident in their rugged appearance, feeding on reeds and hard grass, preyed upon by leopard and suffering in years of drought. Away from the attention of the public, they lack the protection given to the Garub horses. The Garub borehole is the pivotal point for the survival of the horses. It was drilled in 1906 at the time of German South West Africa to provide water for the steam trains and was one of the first water sources in the desert. When the South African troops landed at Lüderitz during the First World War, the German troops were blowing up the railway line in sections. The South Africans advanced, repairing the line to ensure the supplies from Lüderitz on which they relied. Eventually they reached the Garub borehole, where they stayed for a month. The Germans in Aus, 20 kilometres away, were concerned that they were going to be cornered there as South African forces were also approaching from the south-east and decided to retreat from Aus to Keetmanshoop and the north. When the South Africans left, they would have stationed someone at the Garub borehole to continue to pump water for the trains and for the town of Lüderitz, which was dependent on Garub and the ships arriving in the bay for fresh water. The water that spilled around the borehole during pumping operations attracted the horses. It is presumed that the people left to maintain the borehole must have shared the water with the animals, beginning the thread of people wanting this group of horses to survive. The horses that scattered after the bombing at Garub would have known to come back to this water source, although it probably would have taken them three or four days to return. After the war, the South African Railways (SAR) maintained the railway line and the borehole until the early 1970s, when they started using diesel locomotives and had no more use for the water. They removed the employee stationed at the Garub borehole and no water was pumped for at least two weeks. Jan Coetzer was the head of security for Consolidated Diamond Mines (CDM) at the time. He patrolled the area as a security officer and, being a horse person himself, knew the horses quite well. On his patrol, he found the borehole abandoned and the horses dying of thirst. He pumped water for them and immediately sent a letter to the SAR to request permission to station someone there to pump water for the horses. That was the first time the borehole was used to pump water specifically for the horses. From that time on, he served as their custodian. 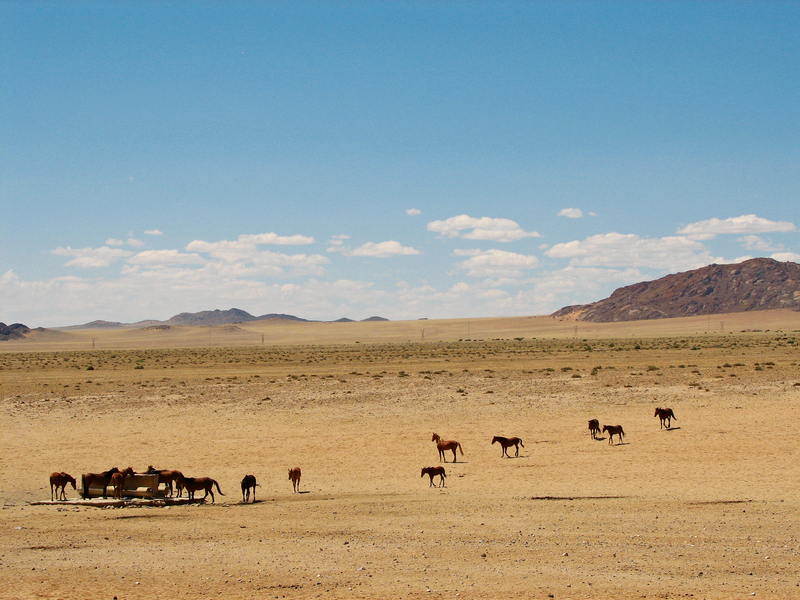 In 1986, when the area was incorporated into the Namib-Naukluft Park, the horses became the responsibility of the Ministry of Environment and Tourism (MET) and Nature Conservation. They used the borehole until 1991 when they built the troughs where they are at present—four and a half kilometres east of the old borehole. They now use a borehole (belonging to MET) that was drilled by farmers for emergency gra­zing to provide water for the horses. The borehole is a few kilometres east of the troughs, and collects water in a reservoir from which the troughs are gravity fed. When the land became part of the Namib-Naukluft Park in 1986 and the MET took over responsibility for the horses, they carried out the first aerial count and counted 168 horses, a number which increased in the good rain years of the late 1980s. In 1990, a French journalist, Jacqueline Ribart, camped at the old borehole for a month to observe them. In a report to the MET, she noted that she had counted 276 horses. Although limited, her report was the first study on population structure. In 1991/1992 a severe drought affected Southern Africa, and there were widespread attempts to rescue game. When the drought reached Namibia, local people began to ask the MET about the starving horses and wanted to sponsor food for them. Initially the MET was reluctant, but decided to capture some of the horses to relieve the pressure on the herd. Because they didn’t have any detailed information about the population, they caught randomly (the best thing to do if you don’t know the population) and sold them off. A hundred and four horses were sold to interested horse owners, at N$120 a horse. 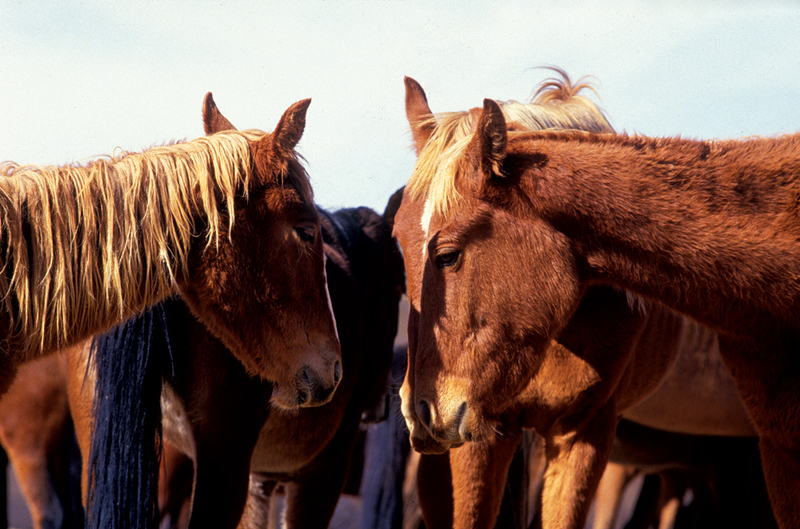 After the capture in June/July 1992, lucerne was put out for the remaining wild horses. The effort, sponsored by CDM and horse lovers from all over the country, was orchestrated by Oom (Uncle) Jan and the Oranjemund Ri­ding Club and implemented by the MET. There were stories of children contributing their pocket money for the cause. 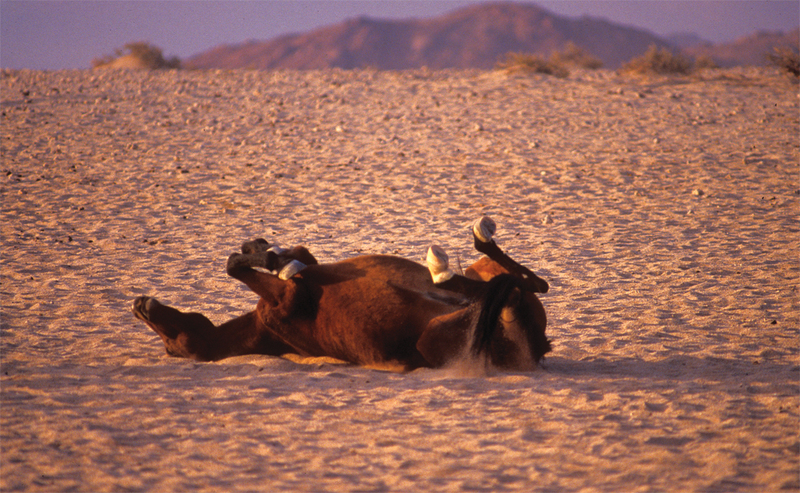 Even with the lucerne and the reduced numbers of horses, 60–80 horses died during the drought, mostly old and young ones, survived by the stronger middle-core group. It finally rained in March 1993 and within a month the wild horses became fat and healthy. The captured horses, however, didn’t fare as well, remaining thin for another year. 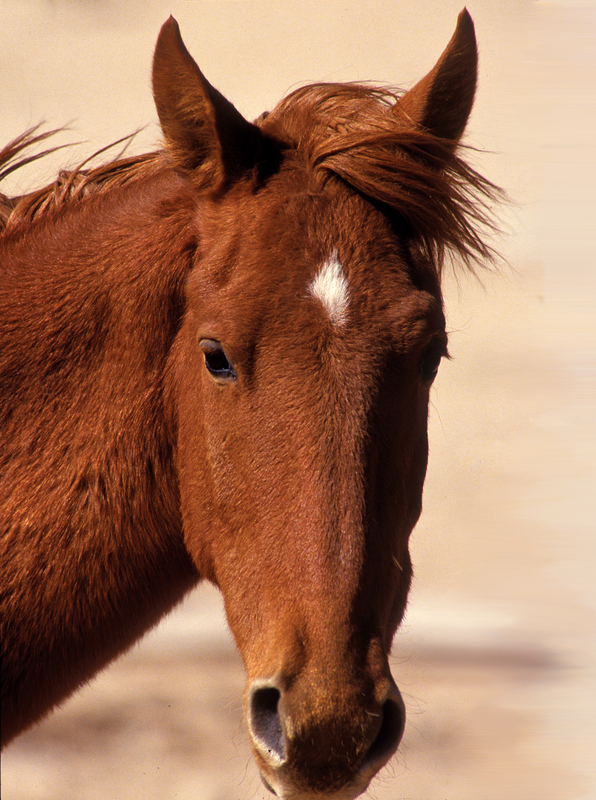 The horses that had been translocated within Namibia into areas with similar grass species adapted, with the exception of those taken into areas of horse sickness and biliary. Having no antibodies, they were immediately susceptible. The ones taken east, struggled to adapt to their new environment, taking more than a year to gain condition. Even after vaccinations, horses were still lost. Some were also badly injured in fences and camps. Fifty of the translocated horses died within the first two years. 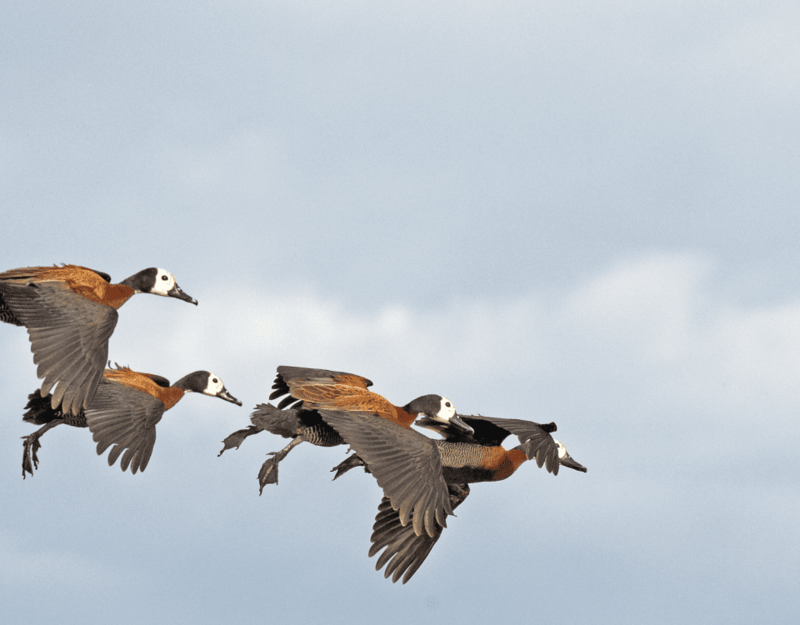 This article was first published in the Flamingo August 2010 issue.